I didn't plan two Cronenberg flicks on purpose, but tonight's movie was definitely an interesting contrast to VideoDrome. That one was much more representative of what I think of David Cronenberg's body of work, but this one was much more interesting to me. You probably couldn't classify it as a straightforward horror movie, but it's a good example of a psychological horror movie. Like I said above, this isn't strictly a horror movie, but it definitely has several of those trademark Cronenberg touches, including a bizarre dream sequence. Jeremy Irons gives a fantastic performance. At the beginning of the movie, you can clearly tell each twin's identity from his appearance and mannerisms. As they begin to slip, though, and lose their identity, it becomes harder to tell them apart, until the last scene, when it becomes impossible. I give this one four speculums out of five. Ok, first off, a guy named Beverly? You know he's going to be strange right away! And why are twins a natural scary thing? My husband is a twin and there's nothing scary about him. Of course he's a fraternal twin. . .
And that speculum?? I may not come back here for a while! It's not that twins are naturally scary, it's that when they are scary, there's TWO of them! The same rule applies for sexiness. This past week, we watched "Seconds Apart," which is a more recent horror movie about creepy twins. 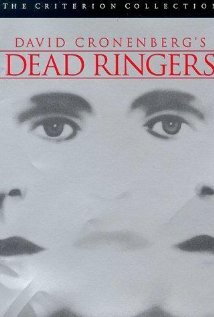 "Dead Ringers" was better (and very different), but I'm interested in your thoughts on it. Have to check that one out. Thanks for the tip! I've never been able to put my finger on this movie. I never know quite what it's about in the end. I guess I never get why gynaechology is such a constituent part of the story - I know it's linked to the twins and their birth, but I guess I expect more out of the notion of bodily health itself, and a woman's body, perhaps following on Cronenberg's earlier The Brood. We get to the end and Irons' and Irons' breakdown and I'm like, well, that was really well done, but what am I supposed to take away from this?